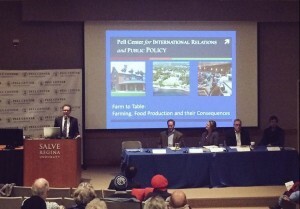 The Pell Center’s opening panel discussion for the 2015 Spring Lecture Series, “Farm to Table: Farming, Food Production and Their Consequences,” emphasized how all American citizens are involved in the national food system and offered several different perspectives as to why its important for the public to be more aware of their choices, and their impacts, when it comes to food. Regardless of the various dietary restrictions Americans abide by–vegetarian, vegan, gluten-free, or none–every citizen is a stakeholder in the American food system. 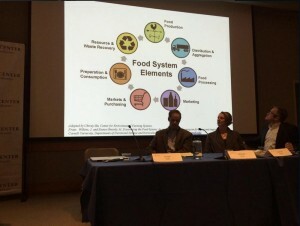 Before introducing the panelists, Senior Fellow for Public Policy Dr. Joseph Grady provided a background on the six components of the food system–production, processing, distribution/transportation, preparation, consumption and waste return. In turn, Dr. Grady explained how this elaborate system affects areas such as health, climate, communities, economy and the environment. The first speaker, Dr. Jameson Chace, Associate Professor in the Department of Biology and Biomedical Sciences at Salve Regina University, posed the challenge of food to the audience. He mentioned the growing population and the evident need for a growing food supply. According to Dr. Chace, agriculture has a great effect on the land, and the growing need for food naturally requires more land space to grow this food. The amount of land needed to supply a population with food often is not available. This creates the challenge of producing more food in smaller spaces. Chace also mentioned a concerning and surprising statistic—that Rhode Island only grows one to two percent of its food. As a result, almost all of Rhode Island’s food must be transported from other areas of the country and the world. 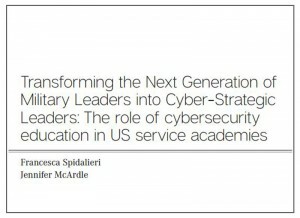 The lecture continued on with Courtney Bourns, Senior Program Officer for the Henry P. Kendall Foundation in Boston, M.A. 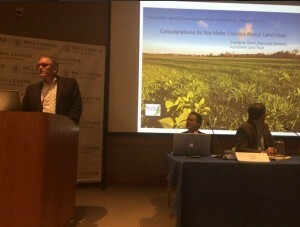 Bourns reiterated the foundation’s concerns: conservation, climate change, and food systems in New England. 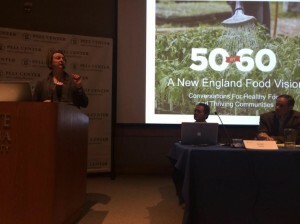 The foundation’s goal is for New England to produce fifty percent of its food, a lofty goal considering that New England only produces seven to ten percent currently. 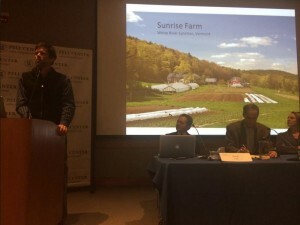 Bourns mentioned that New England’s current state of food production is problematic because it “leaves us vulnerable.” In order to fix the problem, Bourns said that farms must become like thriving businesses, and six million acres of land in New England must become farm land. In order for this to happen, our current food system must change. 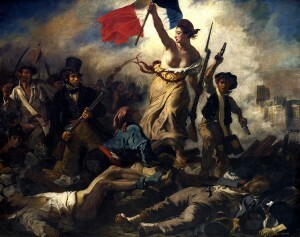 Bourns mentioned how people must first dedicate more money to food, and to better food. Focusing more on land usage and farms, speaker Chuck Allott, Executive Director of the Aquidneck Land Trust discussed the historical and current zoning system, and its effect on the food system. The zoning system dictates areas of land as purely residential, industrial, school, or farms, etc. Since the 1940s, eighty percent of what used to be farm land is no longer farm land and is now homes or schools. 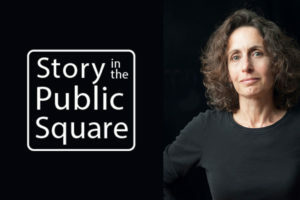 Allott suggested a solution that would aid in the Henry P. Kendall Foundation’s goal of six million acres of farm land presented by Courtney Bourns: mixed uses in zoning districts. Allott proposed that if school zones and residential areas, for example, could include farms, there would inevitably be more farms. This proposal speaks personally to the final speaker, a Vermont farmer. The final speaker, Chuck Wooster, a farmer from Vermont, pointed out that there are more farms in New England now than there have been in the past half century. Wooster’s farm, Sunrise Farm, has been a farm since the 1800s, but has been within his possession since the 1990s. The farm grows vegetables and supplies lamb, chicken, pork, maple syrup, logs, and biomass chips. Wooster discussed modern farming and how farms benefit communities. Sunrise Farm is a community supplied agriculture (CSA) farm, meaning that it allows people to receive fresh food directly from the farm through a “farm share” type of program. The farm uses Hoop Houses and Row Covers, which cover the crops and protect them from bugs and weather. The farm also has electric fences to protect the animals against predators. In accordance with all that the previous speakers discussed about food production and farming, Wooster and his farm exemplify a part of the solution to the many challenges within the food system.